The Turkish side is not responding to efforts to lift the deadlock and proceed with the resumption of settlement talks in Cyprus, said Presidential Commissioner Photis Photiou, querying whether the Turkish demand for a positive vote on all decisions is a sign of political equality or rather political inequality. 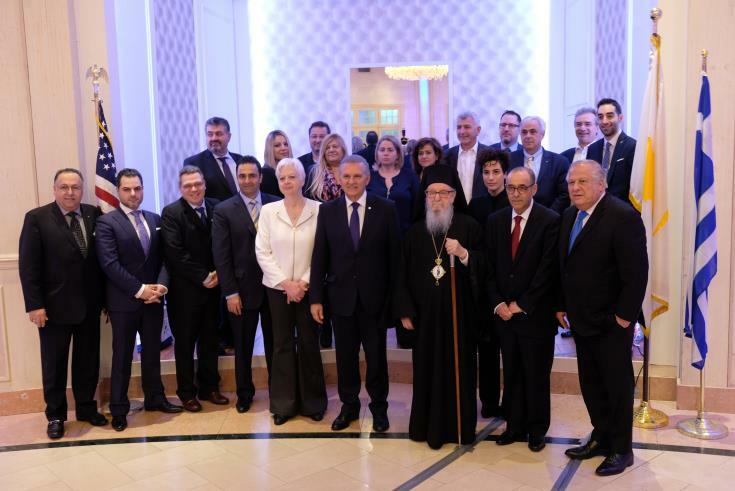 Photiou was addressing the Conference of the Federation of Cypriot American Organizations, on Saturday in New York, in the presence of representatives from all organizations, Archbishop Demetrios of America, Cypriot and Greek diplomats and the MEP and President of the Solidarity Movement, Eleni Theocharous. He also announced that the term “Overseas Cypriots” will be replaced with “Diaspora” in the next Conference of the World Federation of Overseas Cypriots (POMAK). Speaking about Cyprus developments, the Presidential Commissioner reiterated the readiness of the President of Cyprus, Nicos Anastasiades, to continue the dialogue from the point it was left off at Crans Montana, during the 2017 the Conference of Cyprus, due to Turkey’s refusal to accept basic parameters set by the UN Secretary-General himself. Photiou referred in particular to the termination of the anachronistic system of guarantees and intervention rights, as well as to the presence of Turkish occupation troops in Cyprus. He also spoke about the interpretation of the Turkish Cypriot side regarding their effective participation in the administration and the Turkish insistence for equal treatment between Turkish and Greek nationals. Apart from these problematic positions, what should worry us all is the clear intention of the Turkish side, seeking to control all of Cyprus, in order to serve its own interests in the region and beyond, Photiou underlined. The Presidential Commissioner also briefed participants about the President’s positions and the deliberations taking place with the UN Secretary-General’s envoy, Jane Holl Lute, aiming to formulate the terms of reference that will pave the way for the resumption of settlement talks. He said that the President reiterated in an unequivocal manner that he accepts the political equality of the two sides and the notion for an effective participation of the Turkish Cypriots in the administration, as well as the positive vote, when circumstances allow for a positive vote to be cast in a way that any decision of state institutions does not adversely affect the interests of the Turkish Cypriot side. Moreover, Photiou said that during his recent meeting with Lute, the President focused on all aspects of the Guterres framework, including the termination of guarantee and intervention rights, the withdrawal of Turkish troops, as well as the territorial and other aspects that are part of the Secretary-General’s framework. He also underlined that it is for the interest of all countries to have a Cyprus solution that does not turn Cyprus into a vassal state of Turkey, but secures rather its independence, sovereignty and its attachment to EU’s democratic values. The Presidential Commissioner also spoke about energy developments, and referred to the trilateral cooperation schemes and the presence of US Secretary General Mike Pompeo in the latest Cyprus-Greece-Israel Summit, in Jerusalem. He added that despite Turkish provocations, Cyprus continues its energy program, and said that he was encouraged by the results of hydrocarbon research activity and was expecting even more positive results. During his speech, Photiou also referred to the drafting of Cyprus’ National Security Strategy, noting that Overseas Cypriots and the diaspora are an integral part of it. He briefed finally conference participants about the humanitarian problem of missing persons and the action plan the Cabinet is discussing, in an effort to increase diplomatic activity and raise awareness, also in the United States.